Little Miss Piggies Cafe - independent family run cafe specialising in traditional English food - good value all day breakfasts and brunches cooked freshly to order. 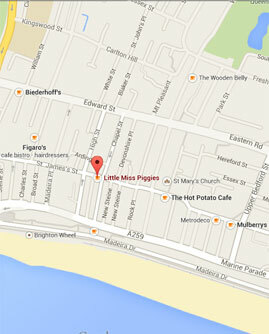 Start your day the Little Miss Piggies way with an English Breakfast for only £3.95. Nothing too fancy - just plain "home-cooked" English food at its best at an affordable price. We have just introduced a Hangover Breakfast which, we are told, does what the name implies - cures your hangover !!! It is also good for those without a hangover who just want a good "fry-up". See our menu page for full details. 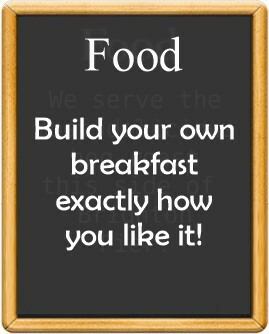 If you are not too hungry, on a diet, or a vegetarian - our menu has something for you too with our Light Breakfast, Low Fat Breakfast, Vegetarian Breakfast or "Build-Your-Own" breakfast options. We serve top quality 'Drury' coffee in the form of latte, espresso, cappuccino etc. We also have a selection of cold drinks and a variety of teas and a very special hot chocolate. We pride ourselves in giving very good value for money. .. but modern in outlook - providing free wi-fi, free newspapers to read and accepting credit cards for all purchases. Look out for us on Facebook, Twitter, FourSquare and Tripadvisor. Feel free to leave your own reviews there too. When trying to find us, look for our bright yellow shopfront! Most of our food is cooked to order which may mean a short wait but it will taste amazing and cost very little. If you are in a rush, please let us know and we will try to hurry your order through or you can ring your order in to us and collect at your convenience. While you are waiting, you can have a drink and chat to us, read our free newspapers or browse the internet using our free wi-fi. We are happy to take credit cards for all purchases (no minimum). 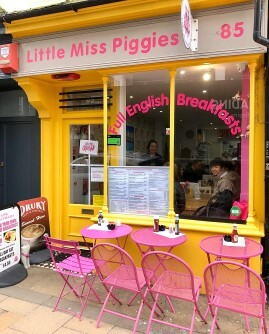 "Little Miss Piggies" is a small family run café located at 85 St James' Street in the Kemp Town area of Brighton opposite the Co-operative supermarket and between the hairdressers with the pink frontage (Marc Scot) and the carpet shop (Kemp Town Flooring Co). If you are approaching from the sea, look for the Brighton Zip Wire on the seafront near the pier and then walk one street inland. � Copyright 2019 Little Miss Piggies.